I’ve been pretty slack of late but you’ll have to forgive me – I had a wedding to attend, in Lombok, at a resort… it was sublime. If you ever need a break to just relax, may I respectfully suggest you check out Qunci Villas, Lombok. Amazeballs. The wedding was OK too…. Kidding! Of course the wedding was the highlight, the ceremony was stunning and the reception was in the most beautiful villa I have ever seen, bar none. AND, to my immense satisfaction, the food was superb. Not strictly Paleo, but fantastic nonetheless. As we know, sometimes it’s OK to fall off the wagon, right? If you don’t know what I’m on about, see here [insert link to previous post]. I can continue to enjoy the light and clean feeling I have. I can continue to eat as much as I want and still remain lean and healthy. I can continue to feel great about the quality of nutrition I am putting into my body. I can continue to discover tasty, satisfying recipes that I never, ever have to feel the slightest twinge of guilt about eating. I think that my husband I wordlessly decided, quite a few weeks ago, that we would never go back. “Going Paleo” was probably the healthiest thing we have ever done and neither of us wants to undo the good we believe we’ve done ourselves. Yes, we now include some dairy in our diet, and we occasionally have non-paleo meals when out and about, but on the whole we are very, very happy with how we choose to live. So many people ask me, ‘so are you still doing that diet?’, and seem shocked when I say yes – and then confused when I follow up with, ‘Well, it’s not a diet; it’s more a way of living.’ It seems inconceivable to so many that I could cheerfully say goodbye to grains and legumes, forever. Especially when they realise how much of the modern diet contains grains or legumes such as soy. But, I say, why wouldn’t I continue with this way of eating when it works so well for me? When I’ve slimmed down, feel 100% better, no longer suffer from any digestive issues, have clearer skin and best of all, feel so emotionally / mentally good about how I’m treating my body? I know loads of people who have ‘tried’ Paleo and been unable to stick it; that’s fine. At least they tried it. And loads of people who say ‘Oh I could never do that, I love [insert variable item here] too much.’ Again, that’s fine. I have very little desire to ‘convert’ people to Paleo. It’s not a religion and I don’t think anyone who isn’t Paleo is any less responsible, any more likely to die than me, etc. Sure I’d love for everyone to feel as good as I do and I sincerely believe that everyone would be better off if they ate this way, but it’s not up to me. These are my beliefs…I won’t preach. But for those who try to ridicule my husband or myself, or judge us for our choices – well, I’ve no time for them. I have plenty of information to support my beliefs and am happy to discuss the ideas behind Paleo with them. They aren’t really the listening type though. So – how are we going, overall? What foods are we eating? Well, typically for me breakfast is eggs and bacon – fried, or in scrambled eggs; or breakfast muffins, or a recent favourite is fried eggs on sweet potato ‘toast’ [soooo yum]. An alternative to this is what’s known as ‘intermittent fasting.’ Not for everyone – my husband doesn’t do it – it basically means cutting out one of the “standard” three meals per day, or, in more Paleo friendly terms, increasing the non-eating period in a day from the typical 8 hours [sleep time] to 12 – 16 hours. I literally do it only because, some days, I am simply not hungry when I wake up and so I don’t force myself to eat. As a bonus, it gives my digestive system a longer period to clear itself out once in a while. Lunch can be anything – I have things like left overs, salmon or chicken and salad, or jumbled veggies. Dinner – seriously the sky is the limit. We’ve had every meal you can think of from chicken schnitzel to roast beef to Thai green curry with [cauliflower] rice. Or my personal favourite so far: Bangers n Mash …grass-fed beef sausages with cauliflower mash n onions….oh my lord it was good!! Snacks: Kale chips, sweet potato or beetroot chips from Coles/Woolworths; homemade granola bars, banana or pumpkin bread, nuts or fruit; maybe date & cocoa balls if we want to be naughty [too much sweet is still not ideal, even when the “sweet” is not sugar!]. What we drink: water and sparkling mineral water [sometimes with a slice of lime for something different] with <10% sodium/100ml; my husband also loves coconut water but me, not so much; coffee [white, but no sugar, and max 2 cups per day] and black or green tea. That’s truly it. What we sometimes eat: dairy [cheese, milk, ghee], potato and for me, pasta. Not often though. It’s a special treat and I cannot wait to try to make sweet potato gnocchi. I was wondering if it was possible and then had it at that resort I just stayed in – see the start of this post! – and it was absolutely scrumptious. So that’s on my soon-to-do list! What we sometimes drink: wine [white and red, organic preferred], vodka [with mineral water & fresh lime] or very, very occasionally my husband will have a couple of beers. Reading back over that, I almost feel like it sounds quite staid and boring but I can assure you it isn’t, the possibilities are endless and you are limited only by your imagination or your internet connection. So that’s it. 3 mths of Paleo, done. Would be awesome if I could put up before and after photos but I didn’t take any before shots. Really wish I had now! And got the ‘before bloods’… apparently it is a startling result for most. My only question at this point, is whether or not to continue this blog… I mean it was supposed to be about my journey from Pleb to Paleon, which is kind of complete… but on the other hand I am really enjoying sharing my thoughts. Hmmm. I guess I’ll have a think and see if I think there’s more I have to offer… let me know YOUR thoughts, if you want – do YOU want to see more from me? Either way, I’ll be sure to be back at least once, if only to say a final adieu. Oh, PS – I just found another great site for us Paleons: paleononpaleo.com – check it out! An experience shared is an experience doubled..
1. Its costs more to eat well. My grocery bill is almost double – fresh produce and lots of meat, particularly where I live, is expensive. Two adults are eating their way through around $300 food a week. But, like I said, this is due in part to the fact that prices up here in Northern WA are super high because we’re a remote community. Lucky me. 2. Grocery shopping takes about 1/10th the time it used to and is super easy. It really is true, you just go straight to the fresh produce end, grab fruits & veg, skim along the back grabbing your meat and then pop into the freezer section at the other end to grab any frozens [eg fish, snap frozen veg, shellfish, etc.] Then, unless you need to duck briefly into the darkside (read: the aisles) to visit the health food section [almond meal, organic raw honey, Linseed meal, etc] or the asian section [coconut cream, coconut milk, tapioca flour], you are DONE. Bang! Snap! Straight to the pool room! [For those outside Australia, this is a quote from a very Australian 1997 movie called “The Castle”. Its hilarious but please don’t think all Aussies are like the Kerrigan’s… except for the giant hearts part]. So – it really does take 10-20mins max to get everything you need because you only need to run the perimeter of your local supermarket. Score! 4. You will consume an enormous amount of eggs. If you can – buy chickens! I wish I could but our living arrangements [and our Siberian Husky, to be honest] kind of puts a kabosh on that. So if you’re in my boat, at least study up on what eggs are available to you, go for something reasonably priced if you can but do NOT ever, EVER purchase cage eggs – its abhorrent and I think it should be totally banned; strive to purchase free range, naturally fed hen eggs [eg grass fed, not grain fed] and always look for Omega3 enriched eggs. If you can’t tick all the boxes – try finding Omega3 enriched eggs in my town 😦 – tick as many as you can, and at minimum, buy free range. Or go without. Seriously. 5. Snacking is hard if you a) don’t like nuts or b) don’t like fruit and/or are trying to lose weight. For those of you who do like nuts and or fruit and or are not trying to lose weight – you can skip straight to the end. Do not pass GO, do not expect $100 or a make up learning. You only get four. For the rest, read on. Left over roast chicken from last night. Well. That’s some seriously limited choices. The ‘easy’ snacks are nuts and fruit. What if you don’t like either?? I am not a nut fan and don’t really like fruit overly much. Plus, for those who are trying to slim down, consumption of fruit should be limited until you reach your goal leanness. So what do you do? I think this is where your dedication [or lack thereof] to Paleo will really show and imagination is super useful. Prep time on the weekend can also help here – bake some Paleo muffins, or egg/bacon frittata’s and keep them for snack attacks. Find one fruit or nut that you like. Try celery with a nut butter on it. Google ‘Paleo Snacks’ and then don’t be shocked when they are all healthy. First step though: Have a glass of water. Years of comfortable existence have meant that what humans often translate as ‘feeling hungry’ is actually thirst. So if you feel a little pang of hunger, snack size, there’s a good chance that you’re actually just thirsty. So try a glass of water or cup of tea. Wait ten minutes. If you still feel it, search for a snack. So there you have it. Five of many things I’ve learned since 1AP [After Paleo]. Now, if you’ll excuse me, I’m going to go away and think of a title for this post, as the original title I had ‘How do you do what you do?’ no longer applies… as so often happens, once I clicked in the ‘body’ box and started typing, this post became something completely different to my original vision. Oops! So – I have ALWAYS been a huge eater of pasta, potatoes and rice. They are my favourite three foods, I kid you not. Ask my husband. I would eat them for breakfast, lunch and dinner, if I could, if he would [hub is NOT so partial to these three items]. Give me gnocchi – combining two of my favourite things – ahhhh I’m in LOVE. Carbonara – lasagne – spaghetti bolognese; yum! Potato – baked, scalloped, chipped, boiled, roasted or mashed… YUM. And rice – well, I love risotto and then after that rice just is a great accompaniment to so many meals… chilli con carne, lima bean soup, curry, steak and eggs, tuna…. yuuuuuuuuuuuuuuuuum. And my favourite meal of all time just happens to be chicken schnitzel with salad and mashed potato. Which I cannot have anymore – not the schnitzel, not the mashed potato. And I mean, come on!! I want to be healthy but I still want to LIVE!! Chicken breast – sliced in half to create a thinner ‘steak’, but you could just bash it a la schnitzel – spray with olive oil, coat with dukkah of your choice [avail in Coles or at gourment stores for those of you lucky enough to live near anything! ], bake in the oven at 180 deg for 20-25 mins til cooked through. Roasted Sweet Potato – roughly chop rosemary, peel and chop sweet potato. Toss in olive oil & rosemary, put in a baking dish and sprinkle with salt. Bake at 180 deg for approx 40 mins. [I do these first, then prep the chicken and chuck it in the oven for the last 20-25 mins of the potatoes]. Ok, so its not exactly my dream meal, but it IS pretty close, and you can always fry the chicken rather than bake, just maybe use almond meal & egg to bind the dukkah more firmly to the chicken if you do that. Dukkah is a GREAT alternative to breadcrumbs if you can get a good one. So – challenge raised? You bet. Bested? Hmmm maybe 90% – but I’ll take that! We got a sample meal plan during our first week of Paleo, and I kid you not, it actually said “Graze in the fridge for left overs” in several of the ‘Lunch’ boxes. I was disgusted! How is that good for you, and what if you don’t HAVE any left overs in the fridge??? Then what do you eat for lunch? PS – I’m not a horse. I don’t graze. “I don’t think I’ll be able to follow this, Chris,” was my reaction to that meal plan. So………….right now I’m kinda eating my words, as I eat my lunch which is – you guessed it – left overs. Last night’s dinner to be exact, BBQ Chicken with salad. And the truth is, its happened a couple of times already – we make way too much food at night (I have NO sense of portion sizes) and since starting this Paleo thing, not finding myself too hungry (today was an exception) – so what do you get? Left overs. Better to eat than throw out, right? I mean, pretty sure I still disagree with the direction in the meal plan – they should have at least provided an alternative for those not portionally challenged like me. But I’ll admit that eating leftovers isn’t to shabby and nor is it unheard of in our household – just not really ever been the ‘plan’, if you know what I mean. As the days have passed, we’ve gotten more adapted to this Paleo thing and more often than not lunch (on weekends, in particular) is made up of left overs. That said, we’re finding we always have so much fresh produce in our fridge (and we have nearly totally eliminated throwing out things that have ‘gone bad’ because we eat them first!) that if we don’t have any left overs, there is always something there we can make. And I guess that this style of eating is very true to the Paleo theory – I suppose our ancestors more often than not picked at what was left of yesterday’s ‘main’ meal for the day until it was time for today’s ‘main’ meal. Ek so, ek so – Paleo Girl. I would LOVE to eat some bad food right now! So, its about day 10 and right now I’m in struggle town a little. 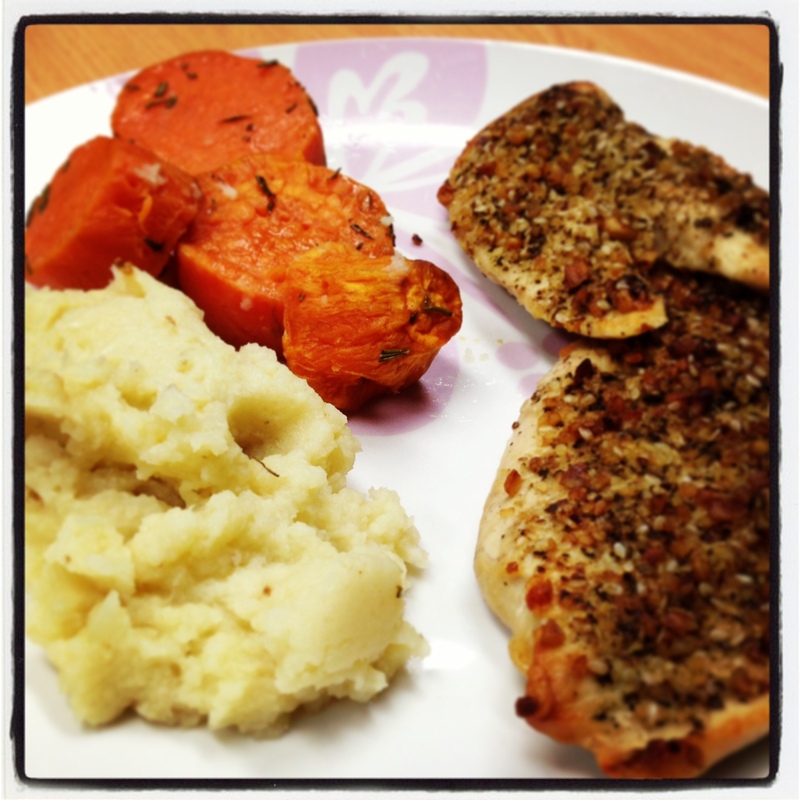 I just cooked a lovely paleo dinner, well, my husband liked it. I thought the broccoli didn’t go so well with the dill, and the stuffed squash was nice but a little sweet for me (I blame the lemon thyme). 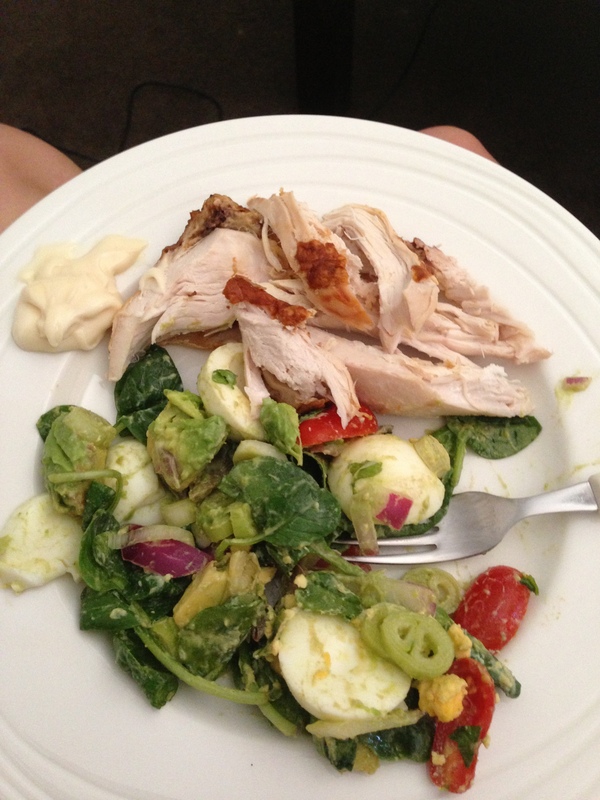 That said, the chicken, pan-fried, sliced and topped with avocado sauce (avo, basil and lemon juice) was pretty nice. But anyways. Today I had eggs and ham for breakfast/lunch (I wasn’t hungry until lunch time > bit of a bonus of this way of eating) and then made some pumpkin bread … worked out ok. So then put together this dinner and though Chris enjoyed it – I’m not feeling satisfied and I am DEFINITELY craving something naughty. Like chocolate. Or chips. Or cheese. So instead I have a handful of grapes. Hmmmmmm. I guess this is why newbies are often told to go 80/20 – you’re allowed to have a little naughty stuff so you don’t fall off the wagon all together. We’re not doing that though, we’re trying to be strong. God help me if anyone wanders by with yummy smelling food right now! So – we’ve completed the first week of our Paleo Attempt. So far – its been OK. Turns out the dinners and lunches are pretty easy to think of – meat and vegetables, or meat and salad. Its when you want something different that you need to branch out, oh and when you want breakfast. What breakfast can you have without grains (bye-bye bread, bye-bye cereal!) or carbs? Not that I usually have rice for breakfast but still. A lot of eggs have been consumed this week by my husband, lucky for me I don’t eat breakfast so its not been a challenge – until the weekend, when I usually will eat brekky. Solved the problem with scrambled eggs w/chorizo yesterday and today, tapioca crepes with bacon. The eggs were yummy and something I would have eaten pre-paleo; the tapioca crepes were… different. Pretty nice, and surprisingly filling but definitely different. We realised while making breakfast that we’ll need to completely re-learn how to cook things because the ingredients we are now using behave differently (like tapioca). So – weight wise I’ve gone from 61.1kg > 59.5kg; I’ve found myself consuming more fruit / vegetables this week than I have in the past month (which can only be a good thing) and feeling better throughout the day, as in I’m not coming home from working feeling so bloated any more. Maybe its a co-incidence, but we’ll see I guess! Week 2 my challenge is to cut sugar out of my coffee (its the only time I add sugar to anything) and see what Paleo options McDonalds offers. Truly! I really don’t want to say goodbye to Macca’s! Nicest v-day meal ever! 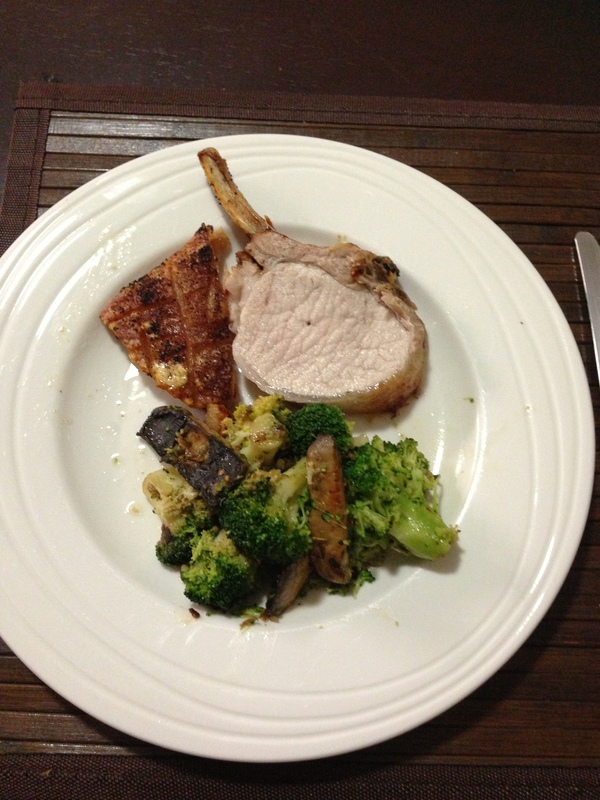 Roast pork with chilli broccoli & mushrooms. Yummo! 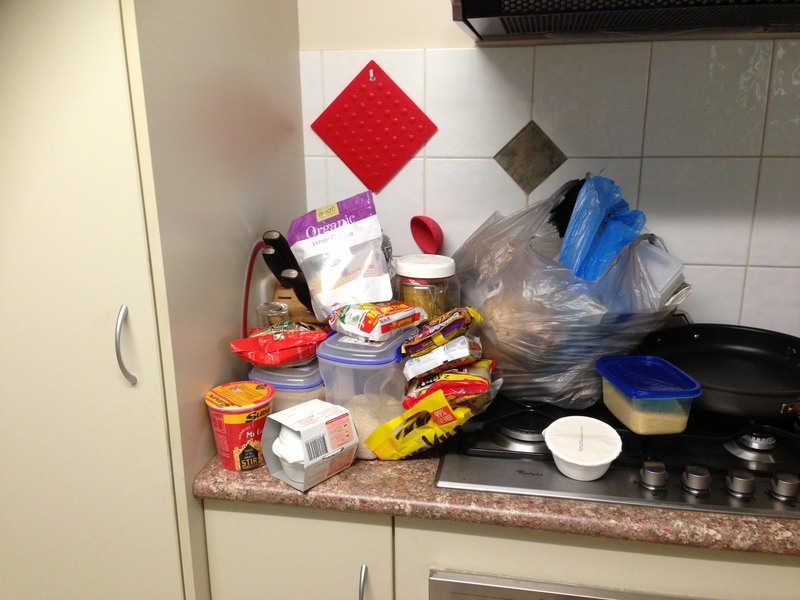 Some of the non-paleo items we’ve removed from our pantry… we probably took out 75% of our food! No exaggeration!